The recent article in the Vancouver Sun about the established presence of Amanita Phalloides (a.k.a. the “death cap”) in Vancouver made me think of the cases I have dealt with over the years where mushroom toxicity was suspected. Mushroom toxicity is a year round concern in the Lower Mainland due to our temperate climate. Cases are under-reported since the diagnosis is often difficult to confirm, unless the ingestion of the mushrooms is witnessed or the pet later vomits mushrooms. When suspected, the diagnosis can be confirmed by identifying different toxins in the blood or urine. The signs of toxicity vary depending on the mushroom families. Some cause mostly gastrointestinal signs such as abdominal pain, vomiting and diarrhea, some cause nervous system signs, some cause red cell breakdowns and some cause liver failure (jaundice, clotting problems) and more rarely kidney failure (anuric kidney failure where the kidney can no longer make urine and the patient dies from the accumulated toxins). 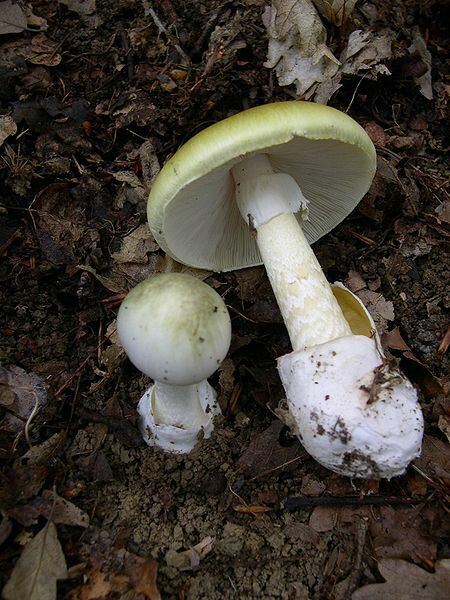 In our patients, Amanita Phalloides is most often associated with devastating, sudden liver failure (called fulminant) which can occur several days after the exposure. There is no specific antidote, and despite aggressive supportive care, our patients rarely survive, as liver transplants are not done in small animals. Sudden liver failure is relatively rare. Some of the causes are: ingestion of acetaminophen (Tylenol), some blue algae poisoning, mycotoxins found in moldy food, or some infectious causes such as leptospirosis. Over the next few weeks, I will discuss the other causes of sudden liver failure but until then, let’s go back to mushrooms! Dr Higgins, one of our neurologists, co-authored a paper on Amanita muscaria toxicity in two dogs. The dogs had both signs of acute gastrointestinal distress and life threatening neurologic dysfunction (drowsiness then seizures). Both recovered with prompt, appropriate care. While many poisonous mushrooms can cause gastrointestinal irritation, the mechanisms of such irritation depend on the type of toxins produced. Here are some common misconceptions about toxic mushrooms. People think that they are easy to identify which they may not be. Toxic mushrooms may look very similar to non toxic ones. Another misconception is that pets know better than to eat poisonous mushrooms. This is not the case, and while cats tend to be pickier in what they choose to eat and are therefore less prone to poisonings in general, cases in cats have been reported as well. For this reason, it is best to prevent pets from eating any wild mushrooms. If you suspect your pet may have ingested mushrooms, the first thing to do is consult a veterinarian as soon as possible. If it is safe, vomiting can be provoked. This falls under the category of intestinal “decontamination” – make the patient vomit, and give activated charcoal to bind toxins. This is usually only worthwhile in the first few hours after ingestion. Additionally, signs of mushroom toxicity may be non-specific, so your pet may need to be tested for other diseases or toxins. The ingestion of antifreeze can cause patients to seem confused or “drunk”, which also can occur with some types of toxins from poisonous mushrooms. An animal specific poison control center such as the Animal Poison Control Center in Illinois can also be contacted. 1-888-426-4435 (www.aspca.org/apcc). If mushroom toxicity is still suspected, examine the area and collect any mushrooms. As some mushrooms grow on specific trees, try to identify the trees or take pictures. Note the site and conditions such as moisture level and what the mushrooms were growing on; place the mushroom(s) in a paper bag (not plastic) so that they can be identified by a mycologist.